Jackson Tijerina of Council Bluffs dressed as Iron Man for Halloween last year. A southwest Iowa boy who’s being treated for brain cancer got a video message of encouragement this week from one of his Hollywood heroes, actor Robert Downey Junior. Amy Tijerina of Council Bluffs, says her 7-year-old, Jackson, was diagnosed in 2016 and was told he needed immediate chemotherapy. She says that’s where the boy’s obsession with the Marvel superhero began — and Downey has played Iron Man in several blockbuster films. One of those friends came through and got Downey to record a 27-second video message of hope especially for the ailing second-grader. 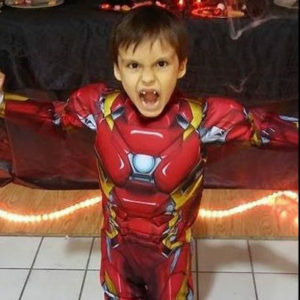 Tijerina says it’s a dream come true for her son to have gotten the video from the actor who plays Tony Stark, the man inside the Iron Man armor. She says her son has other items on his bucket list, but this checks off a big one. She says her son is taking an experimental oral chemotherapy drug which the family gets through St. Jude Children’s Hospital in Memphis, Tennessee. Tijerina says they aren’t sure how well the treatment will work, but they keep making sure Jackson is the happy seven-year-old he deserves to be.